I am participating in the ROM Game Jam this weekend, but before I go and start talking about that all weekend, I just want to update you on the status of the “Cat Project“. I’m in a bit of a hurry, so I’ll try to make it short. To recap, I started this project two weeks ago. I don’t have a name for it yet, so I’m just going to call it “Cat Project” for now. The game is about, you guess it, cats: their behaviours and quirks (both from my experience with cats in real life and what YouTube has “taught” me), their folklore, and some human misconceptions about them. 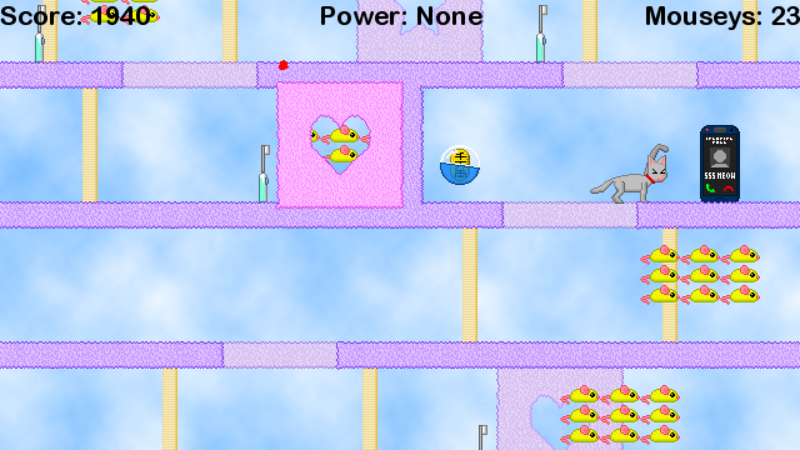 The basic premise of the game is you, as a kitty, have to rescue kittens from the tops of towers and swat away amnoying human technology along the way: noisy smartphones, hostile spray bottles, the unobtainable bright red dot, etc. 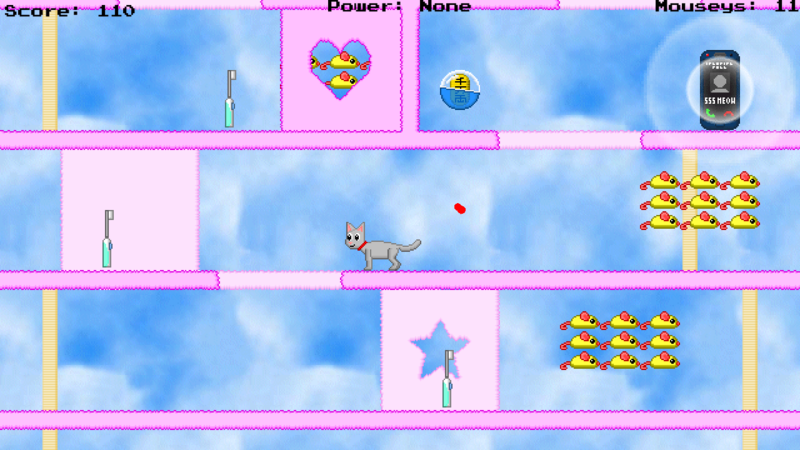 Kitty will also collect “mouseys”, the currency of this game, that will be used to “buy” things. There will be various power-ups that transforms his appearance and gives him special kitty powers, such as “Maneki Neko”, which allows kitty to beckon mouseys to come to him. Redid the foreground and background tiles (they’re still in an experimental phase). I also changed up my tiling system so that characters and objects no longer look like they’re floating above the ground. 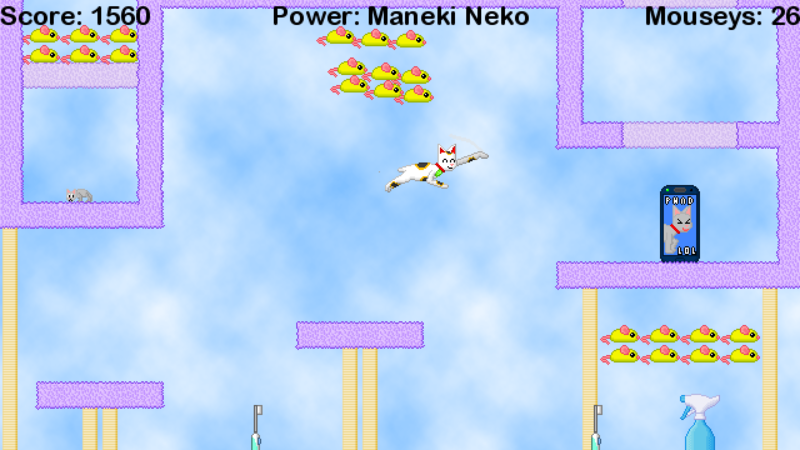 Added graphics for “Maneki Neko“. In Japanese folklore, statues and figures this calico Japanese bobtail in known for beckoning (“maneki”) good fortune to their owners. In “Cat Project”, every time Maneki Neko kitty makes a swipe with his paw, nearby mouseys will be pulled towards to him. Added a new enemy, the Spray Bottle (shown in the bottom-right corner of the picture above). This object seems harmless, but it can attack kitty by spraying him with water without warning. ← KITTY! First look at my upcoming game project: “Cat Project”.